Skiing was second nature for Dunklee, but shooting a rifle at first felt alien to her. In the wake of mass shooting tragedies in the U.S., she has wrestled with ambivalence over using rifles for sport. 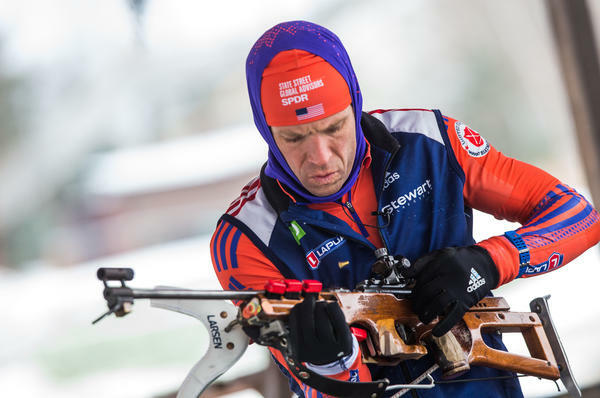 U.S. biathlete Lowell Bailey prepares his rifle before target practice in Lake Placid, N.Y.
After competing at Dartmouth College, Susan Dunklee got a recruitment offer from U.S. Biathlon to join its development program. 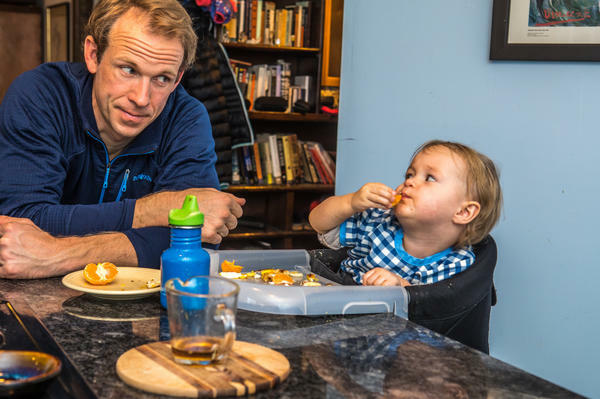 Dunklee, who competed in biathlon at the 2014 Winter Olympics in Sochi, trains at the Craftsbury Outdoor Center in Craftsbury, Vt.
Lowell Bailey runs with his wife Erika and baby daughter Ophelia near their Lake Placid home. Susan Dunklee started skiing pretty much as soon as she could walk, raced for lollipop prizes at about age 5 and went on to compete in cross-country skiing at Dartmouth College. "I've never seen our team in such high spirits," says biathlete Lowell Bailey, 36, who will be competing in his fourth Olympics. 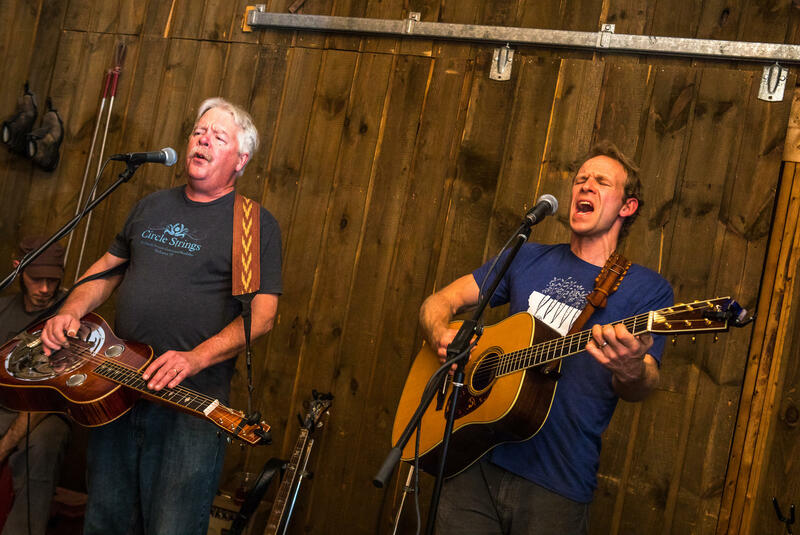 Lowell Bailey (right) performs with John Doan in the local band Big Slyde at Cascade Ski Touring Center in Lake Placid. Lowell Bailey eats with daughter Ophelia at home. She and Bailey's wife, Erika, travel with Bailey on the World Cup circuit. At last year's World Championships, Erika ran and cheered alongside the final stretch with Ophelia, then 8 months old, strapped to her chest. Susan Dunklee receives a group hug from third and fourth grade students after giving a presentation about biathlon at the Craftsbury Elementary School in Vermont. Imagine running up 10 flights of stairs as hard as you can, and then immediately trying to thread a needle. A similar union of two opposite skills defines the sport of biathlon. 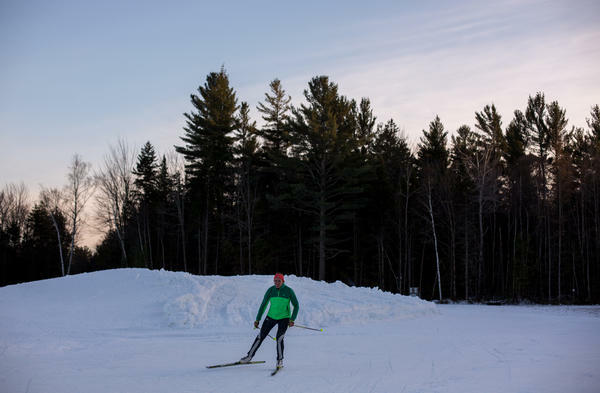 It combines the all-out exertion of cross-country skiing — pushing the limits of human endurance — with the calm, focused precision of rifle shooting. Biathlon has the distinction of being the only winter Olympic sport in which the U.S. has never won a medal. The American team is hoping to finally break that drought this month. "I've never seen our team in such high spirits," says biathlete Lowell Bailey, 36, who will be competing in his fourth Olympics. "It's palpable. Everyone wants us to achieve that goal." Hopes are especially high for the Winter Games in Pyeongchang: The U.S. team is coming off a year of unprecedented success. Last February, Bailey won gold at the biathlon World Championships, becoming the first-ever American world champion. A few days later, his teammate Susan Dunklee nabbed silver, earning the first individual medal for a U.S. woman at a World Championship. Biathlon requires top speed and maximum cardiovascular strength. 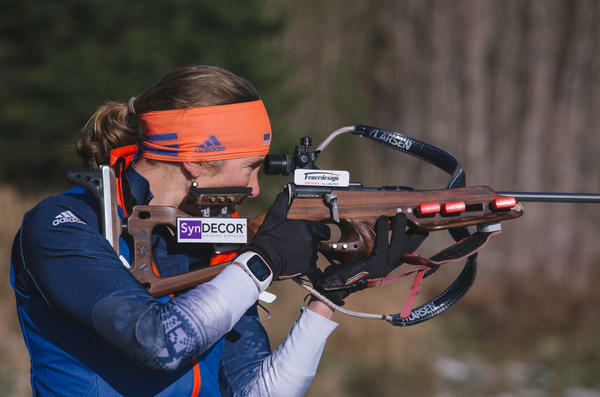 During a race, the heart rate of an elite biathlete carrying a .22 caliber rifle typically hits three beats per second. When athletes reach the shooting range, they have to immediately slow their breathing, steady their hands, calm their nerves and focus with perfect precision on targets 50 meters away. It's one of the most unpredictable, and therefore exciting, sports to watch. Leads change constantly throughout a race. A gust of wind, one missed shot — and a medal that looked like a sure win can vanish. When Bailey won gold at the World Championships last February, "It was one of those days where everything clicked, everything went right," he says. "And in biathlon, that's a rare occurrence." Bailey lives and trains in New York's Adirondack Mountains, where one of his first childhood memories is of riding up high in his father's backpack as he skied through the North Country woods. "Faster, Pop!" were some of his very first words, his mother recalls. By the age of 3, Bailey was cross-country skiing on his own. 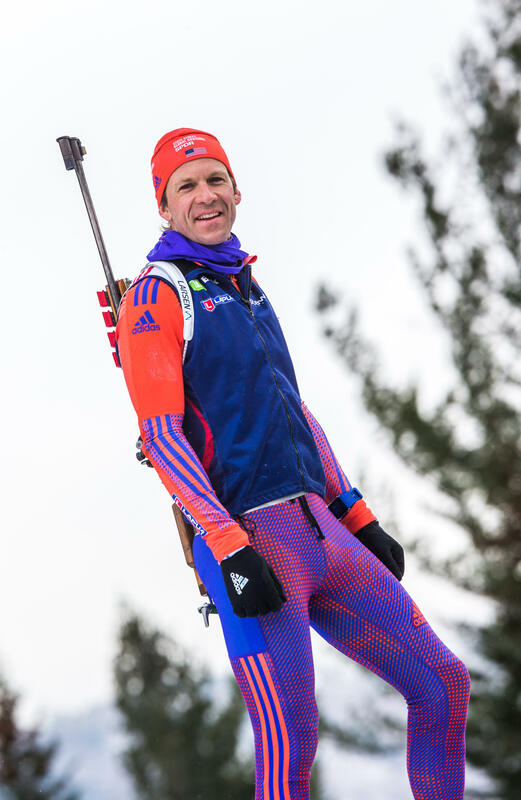 He was racing by age 4, started competing in biathlon as a young teenager and has devoted himself to the sport full time since he graduated from the University of Vermont in 2005. During the 20-km event at the 2014 Sochi Olympics, Bailey missed just one shot out of 20 and slipped to eighth place. It was his career-best Olympic finish, but bittersweet. "I was very, very happy," he says, "but also cognizant of the fact that I was about half a centimeter away from an Olympic medal." Despite its recent successes, biathlon in America remains very much unknown, unappreciated and underfunded, Bailey and his teammates fret. "We're still facing budget deficits coming off of our best year ever," Bailey says. Europeans overwhelmingly dominate the sport, and their teams' budgets dwarf that of the U.S. team. Most European biathletes can count on a government salary and a pension. If they're successful, their government may even reward them with land. Bailey's wife, Erika, remembers a question Lowell got in Finland last year, after he won the World Championship: "Somebody said, 'So did Donald Trump give you land?'" "And it wasn't a joke," Lowell adds. "I have a friend on the women's Finnish team who won World Championships and she was given a plot of land to build a house on." By contrast, top U.S. Olympic biathletes get a stipend of $2,000 a month, plus bonuses if they win on the World Cup circuit. Others on the team scrape by however they can, often paying their own way to compete in Europe. Without financial security, some decide to cut their athletic careers short. "What you see is athletes that stay long enough to make an Olympic team, but then quit because they can't make a living, and they can't ensure their future financially," Bailey says. "Imagine if you're a doctor and you go to work and don't know whether or not you're gonna get a paycheck. That's the life of a U.S. biathlete." And don't bother looking for biathletes on a Wheaties box or in a Coke commercial. Top U.S. endorsement deals just aren't there. Recently, though, Bailey's teammate Dunklee decided to get creative. She was competing in Europe, where biathlon is among the most-watched winter sports on television. Dunklee made a sticker and put it on her rifle, right on the spot where the TV cameras zoom in. "And [it] said, 'Millions of viewers. Your ad here,'" she says. She quickly picked up sponsorship deals from two overseas companies: the Swiss firm Feuerdesign, which makes tabletop grills, and Syndecor, which makes plastic film. Now in World Cup competitions, Dunklee's rifle stock sports logos from both sponsors. Dunklee, 31, lives and trains in Craftsbury, Vt., not far from where she grew up. Her father, Stan Dunklee, was a two-time Olympic cross-country skier. 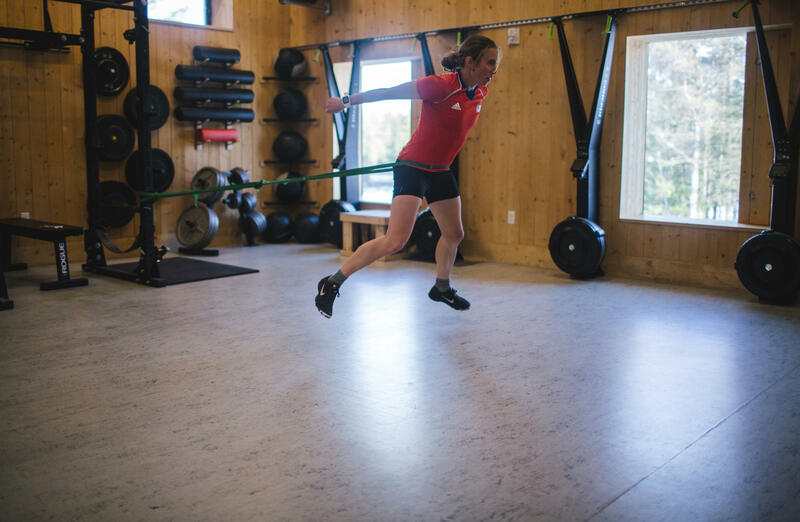 She was skiing pretty much as soon as she could walk, started racing for lollipop prizes at about age 5, went on to compete in cross-country skiing at Dartmouth College and then, out of the blue, got a recruitment offer from U.S. Biathlon to join their development program. The skiing was second nature, but shooting a rifle felt completely alien to her. "I remember going to the shooting range the very first day," she says, "loading the magazine and then shooting and smelling gunpowder. It was just a really foreign smell that didn't belong there." Over time, she got used to it. But last fall, things changed. The mass shooting at a country music festival in Las Vegas forced Dunklee to consider her sport in a new, painful way. "Watching the news after the Las Vegas shooting, I just had this disgust about anything gun-related," she says. "It really took away the joy that I enjoy doing my sport, just thinking about that and the whole gun culture. Most of the time, I kind of forget that my sport is a gun sport. 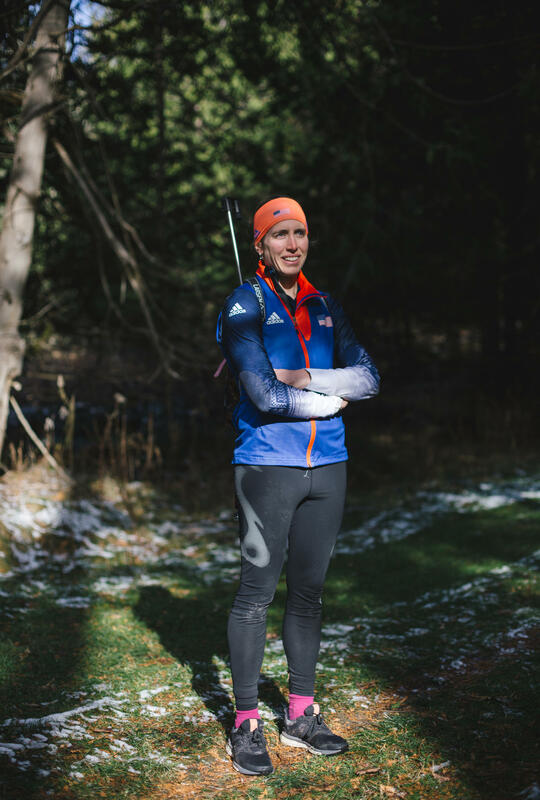 It's just biathlon: to me it's something totally different." Dunklee grows pensive as she talks, wrestling with her ambivalence. "I look at what's happening with all these mass shootings and it's so sad, and it's not OK," she says. "It almost makes me want to just put the rifle down and never touch it again. Sometimes." In the end, she says, she's come to this realization: "To me, shooting well is such a mastery of emotion, and a mastery of your body. There's nothing violent about it at all. There's no anger in it. There's no room for that. It's all about control: being very precise and very calm and collected and Zen-like." "Of course," she adds, "it's a rifle. It's capable of doing serious damage if it's not used in the right way." So at the Craftsbury Outdoor Center where Dunklee trains, rifle safety is the first thing taught to children learning biathlon. 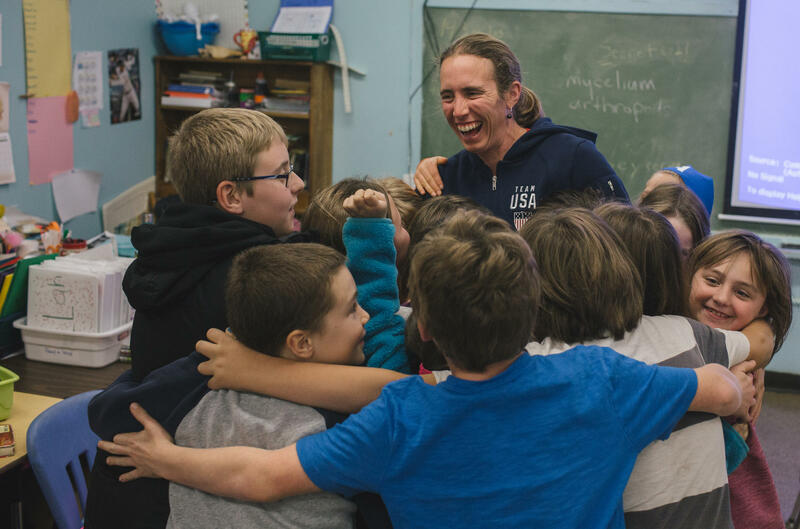 Dunklee helps coach these kids, hoping to build the sport she loves and encourage a new generation of biathletes. And inevitably, one of the boys lobs this question: "Have you gotten any gold medals?" Dunklee doesn't miss a beat. "Not yet!" she says. "That's one of my dreams." There's a sport in the Winter Olympics that the U.S. has never won a medal in. That's the biathlon, which is a combination of cross-country skiing and rifle shooting. NPR's Melissa Block spent time with two top U.S. biathletes who are hoping to break that drought this month at the Olympics in South Korea. MELISSA BLOCK, BYLINE: When Lowell Bailey won gold at the Biathlon World Championships last year, it was a stunning milestone. He became the first ever American world champion. UNIDENTIFIED ANNOUNCER: (Foreign language spoken) Lowell Bailey. BLOCK: Bailey's top finish along with a silver for his teammate, Susan Dunklee, raised hopes that this might finally be the U.S. team's Olympic medal year. L. BAILEY: I've never seen our team in such high spirits. It's palpable. BLOCK: I meet Bailey on a rare break from the biathlon circuit at his home in New York's Adirondack Mountains. That's where he took his first glides on cross-country skis at age 3. L. BAILEY: Yeah, I can't remember ever, like (laughter), not being thrilled by being on a pair of skis. BLOCK: Bailey's 36 now with three Olympics behind him. What's frustrating is that despite the team's recent unprecedented success, biathlon in America is still very much unknown, unappreciated and underfunded. L. BAILEY: We're still facing budget deficits coming off of our best year ever. BLOCK: I would think that as an athlete who's devoted his entire life to this, that that would just be totally galling. L. BAILEY: Yeah, it's - it is galling. UNIDENTIFIED MAN: All right, want to roll? BLOCK: On the day I visit, Bailey grinds through an indoor intensity workout. He'll spend nearly two hours on a treadmill wearing short roller skis, sweating through steep climbs. His heart rate will reach 180 beats per minute, as it will during a race. UNIDENTIFIED MAN: And done. Nice work, Lowell. BLOCK: Bailey has devoted his life to a sport where Europeans overwhelmingly dominate and money talks. The European teams' budgets dwarf that of the U.S. team. Most European biathletes can count on a government salary, a pension. If they're successful, the government may even give them land. Bailey's wife, Erika, remembers a question he got in Finland last year after he won the world championship. ERIKA BAILEY: Somebody said, so did Donald Trump give you land? L. BAILEY: And it wasn't a joke. I have a friend on the women's Finnish team who won world championships, and she was given a plot of land to build a house on. BLOCK: By contrast, the top U.S. Olympic biathletes will get a stipend of $2,000 a month plus bonuses if they win. Others scrape by however they can. L. BAILEY: Imagine if you're a doctor and you go to work and don't know whether or not you're going to get a paycheck. That's the life of a U.S. biathlete. BLOCK: Which means don't bother looking for these athletes on a Wheaties box or in a Coke commercial. Instead, Bailey's teammate, Susan Dunklee, decided to get creative. She was competing in Europe, where biathlon is the most-watched winter sport on television. So she made a sticker and put it on her rifle right in the spot where the TV cameras zoom in. SUSAN DUNKLEE: And I said, millions of viewers, your ad here. BLOCK: It worked. She picked up two endorsement deals with overseas companies. BLOCK: We head out to the biathlon range near Dunklee's home in Craftsbury, Vt. Biathlon requires two totally opposite skills - all-out exertion in cross-country ski racing where you push your body to the limit and then an immediate pivot to relaxed, precise control in the shooting stages. As Dunklee explains, imagine running up 10 flights of stairs as hard as you can and then trying to thread a needle. When I visit in November, there's no snow to ski on, so Dunklee and her teammates run hard through the woods and uphill. DUNKLEE: OK, I'm approaching the range, trying to take some nice, deep breaths, prepare for shooting. BLOCK: They'll be shooting .22-caliber rifles, aiming at targets 50 meters away. DUNKLEE: Bolting. Then I inhale, exhale onto the target and take the shot. BLOCK: The key is to slow your heart rate down, steady your hands and calm your nerves. DUNKLEE: Yeah, that time I had five for five, which is satisfying (laughter). BLOCK: Susan Dunklee has great endurance genes. Her father was a two-time Olympic cross-country skier. She competed in cross-country in college. When she was recruited for biathlon, the shooting part felt totally alien. DUNKLEE: I remember going to the shooting range the very first day and loading the magazine and then shooting and smelling gunpowder. It was just a really foreign smell that didn't belong there, you know? And now I never notice it. BLOCK: But last fall, things changed. The mass shooting in Las Vegas forced her to think about her sport in a new and painful way. DUNKLEE: I just had this disgust about anything gun-related. And it really took away the joy that I enjoy doing my sport, you know, just thinking about that and the whole gun culture and stuff. And it almost makes me want to just put the rifle down and never touch it again. DUNKLEE: Big breath in, big breath out. BLOCK: ...Hoping to inspire the next generation of biathletes. DUNKLEE: Relax onto the target. DUNKLEE: Nice job. Sweet. Bring some gloves next time, huh (ph)? Transcript provided by NPR, Copyright NPR.